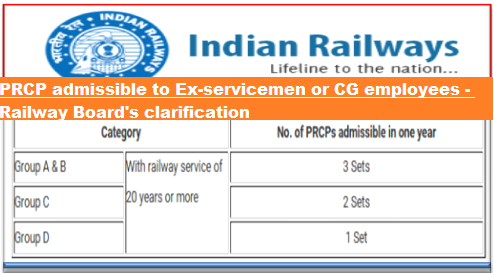 Sub: Clarification regarding entitled number of sets of “Post Retirement Complimentary Passes” (PRCP) admissible to lateral entrants in Railways Service. Ref: (i) Board’s letter No.E(W)2006/PS5-1/28 dated 18.04.2007. (ii) Board’s letter No.E(W)2006/PS5-1/28 dated 08.05.2008. (iii) Board’s letter No.E(W)2013/PS5-1/7 dated 16.12.2013. (iv) Board’s letter No.E(W)2013/PS5-1/28 dated 12.03.2014. In the PNM/NFIR meeting with Board, the Federation have raised an issue that lateral entrants in Railways Service, especially ex-servicemen, who have retired or ceased to be a railway servant, after having rendered more than 20 years of qualifying service (i.e. after addition of admissible past non-railway service) are not being issued entitled number of PRCPs. 2. In this context, your attention is drawn to the amendment made vide Advance Correction Slip (ACS) No.53 to Railway Servants (Pass) Rules, 1986 (Second Edition – 1993), circulated vide Board’s letter cited under Ref. (i) which provided for giving weightage only to the extent of half of the period of past non-railway service rendered by “Ex-servicemen or Central Government employees” for determining their eligibility to PRCP. The said provision was further amended vide ACS No.56, circulated vide Board’s letter cited under Ref.(ii). It provided for counting of half of the period of past non-railway service rendered by the lateral entrants in non-railway departments or establishments to determine their eligibility ot PRCP subject to the condition that the said period of past non-railway service has been counted along with the railway service for pensionary benefits. It was also made clear that the number of PRCPs of such lateral entrants shall be at par with those railway servants who have retired with minimum 20 years of qualifying railway service. 4. Accordingly, it is clarified that the lateral entrants who have retired or ceased to be a railway servant w.e.f. 01.01.2006 after having rendered 20 years or more of qualifying service (i.e. either railway service plus half of the period of past non-railway service counted along with railway service for pensionary benefits or railway service exclusively), are entitled to the number of PRCPs as stipulated in preceding para 3. 5. The Railways are advised to follow the extant provisions of statutory rules scrupulously and issue passes accordingly.